This time, Truweight brings to you a colorful treat of bell peppers and sweet corn. The brightly coloured veggies actually belong to the chilli pepper family, but their mild flavour and juicy crunch jazzes up a salad, adds a delightful crunch to pizzas, and tastes fantastic when grilled! 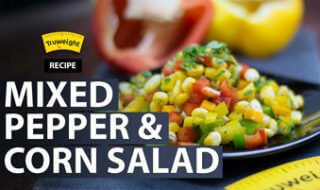 Loaded in carotenoids and vitamin C, this bell pepper and corn salad can definitely add a lot of body to any drab main dish! Oh, let’s not forget the capsaicin in them as well! Go ahead, dig into this simply tasty salad. Take a bowl and place green bell pepper, yellow bell pepper, red bell pepper and sweet corn in it. Add coriander leaves, green chilli, lemon juice, pepper powder and salt to it. Mix them thoroughly and serve. Tangy Salsa Sauce to go with your Appetizers!